High up on the hillside of the magnificent Datca Peninsula reservation, where the Aegean and Mediterranean Seas meet, this exclusive resort exceeds all expectations. D-Hotel Maris has 200 spacious, luxurious rooms, suites, a duplex Presidential Suite and an exclusive Villa. Enjoy elegant dining in exquisite settings while the expert chefs present you with inspiring menus featuring the freshest local produce from the land and the sea. Six bars are dotted around the resort, each offering live music and guest DJ performances. Each of the five stunning, natural beaches offers their own individual aspect for guests: the “Bay”, the “Breeze”, the “Silent” beach the “Executive”, and the “Coliseum”. Explore a wealth of water sport activities, including waterskiing, wakeboarding, sailing, and diving. At the heart of the resort lies an oasis of peace and tranquility – an opulent spa with private scrub rooms, facial and body treatments, using award-winning ESPA products. 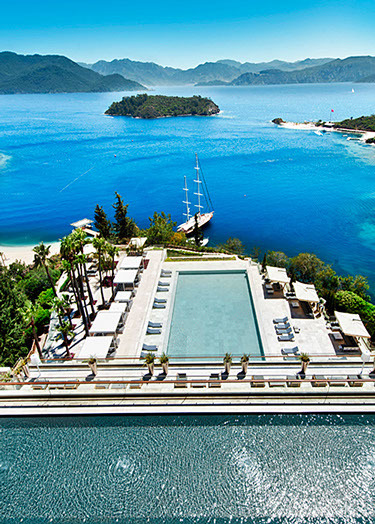 D-Hotel Maris is a member of the Leading Hotels of the World luxury collection. Highlife Luxury Travel Marketing were contracted for one year from February 2014 to March 2015 to launch the hotel into the UK market. As a result of our efforts, D-Hotel now feature with all of the key luxury operators and Turkey specialists in UK.